L.E.A.P Quality Homes & Renovations/Constructions are situated as custom builders in Brisbane Northside. During our 16 years of operation, L.E.A.P have been working to create the best building team possible. In our eyes, this is a combination of commitment, passion and expertise. The people that work for us are our team, and we like to make sure that working is both fun and productive. As well as our carpenters on site, we also have an office team dedicated to keeping your project up to date. With the combination of onsite and offsite personnel, you can rest assured that your project is looked after. If you’re interested in working with us, contact us today. L.E.A.P’s dedication stems from company director, Paul Gillett. He has over ten years experience in the construction of custom homes in brisbane and is a licensed carpenter himself. Paul also has nine years’ experience in IT. He combines these well-learnt skills and experiences to create a winning combination of design and management, through technology and face to face connection. Paul’s passion lies in assisting clients through building quality homes with outstanding results. With a commitment to open communication, he keeps you informed throughout the entire process. This ensures that your project is built to your satisfaction within the desired timeframe. Paul is also dedicated to maintaining the safety of your project and of those working on it. 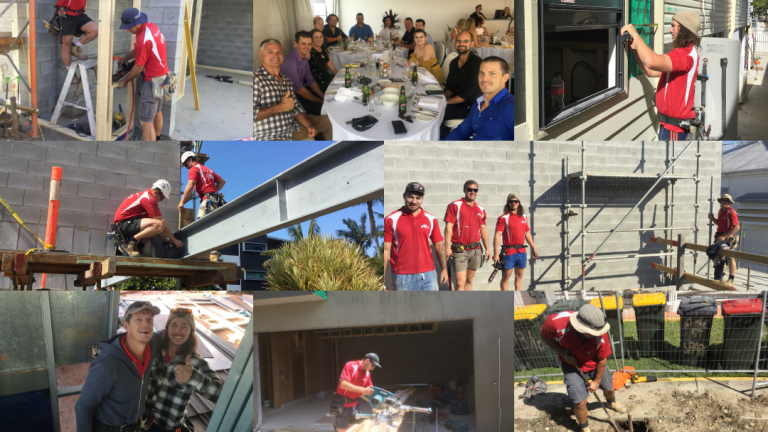 With his passion, drive and building team, Paul is able to provide high end building services to Brisbane. These services result in quality, luxury custom homes and developments. Kristy has been an important member of the L.E.A.P team for eight years. She manages both the office and accounts for the company, whilst also performing duties as client liaison. Kristy has worked in various managerial and accounts roles. These have given her the necessary skills that she uses today. Prior to L.E.A.P she worked for a building certification office. Through this role, Kristy acquired essential knowledge of the construction sector. Including, the different aspects of certification for buildings, and achieving a final inspection certificate (i.e. form 21). In her current role, Kristy is responsible for overseeing company accounts, client interests and both off and onsite matters. During construction, Kristy leads client communications and colour selections. She is one of the driving forces for our high end homes and developments. Kristy works closely with clients and our team to ensure constant cohesiveness during the building process. This is essential for the fast moving process that the building industry demands. With her eye for detail and constant vigilance, L.E.A.P is able to provide a design and build service like no other in Brisbane. Wayne is L.E.A.P’s site supervisor and manages each of our building projects. He is a Q.B.C.C licensed site supervisor and brings over thirty years of experience in the construction industry to the company. Wayne supervises our sites from start to finish at the highest quality level. He is experienced in all facets of construction including but not limited to; the construction of new homes, renovations, heritage homes, and multi-unit/townhouse developments. Below is a snippet list of past projects that Wayne has supervised.